Out of Focus Car Lights - Las Vegas, originally uploaded by The Digital Story. This image was captured from an overpass on Las Vegas Ave., looking down at the cars and lights on the street. I was shooting with a Canon 16-35mm f/2.8 L on a Canon 60D. 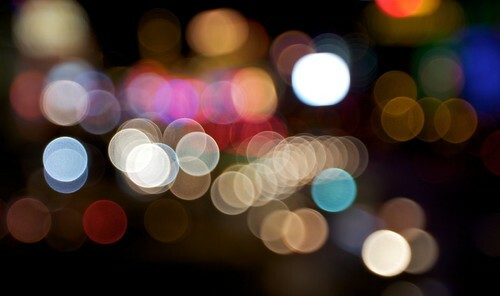 I opened the aperture all the way to f/2.8, then manually defocused the lens to create this abstract bokeh composition. I'm seriously considering making a SizzlPix of this image. I think it would be fascinating to hang on the studio wall. Seen this type of image a few times but never gotten round to trying myself. The bigger the better i think. I'm CEO of SizzlPix.com. Contact me for personal attention.